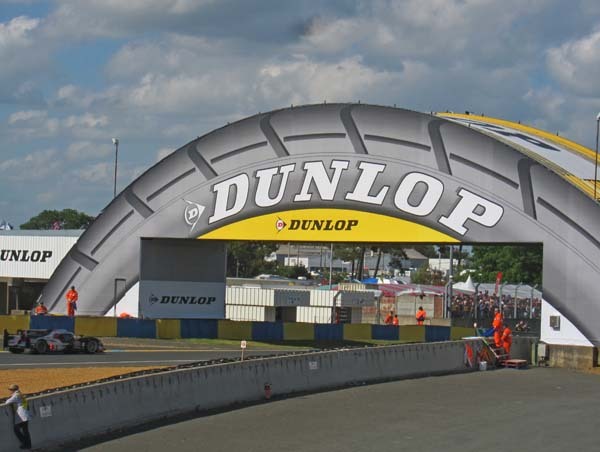 The 24 hours of Le Mans stands as the ultimate endurance motor race on the planet. The contest involves four different series of cars; LMP1, LMP2, GTA and GTE, competing on the same track. While the first 2 categories are all usually fully or at least partially factory funded teams running expensive prototype cars, the later 2 are highly modified street cars or purpose built race cars sold to the well funded individuals or small private teams. The winning team will normally complete the equivalent of 18 Formula One races during the 24 hours. All the while maintaining a higher average speed. The spectacle of watching million dollar factory cars sharing the track with less expensive and less powerful cars is one of the more exciting features of the race format. Although not as expensive as factory teams, a private entry at Le Mans will likely still cost one million dollars. Make no doubt about the money at play in this contest. Within 50 minutes of the last car crossing the finish line, while we were lining up for buses back to the train station, the private and chartered jets began their orderly exodus from the infield landing strip. Race day began with heavy rain showers that gave way to ominous clouds and the early odd sprinkle. 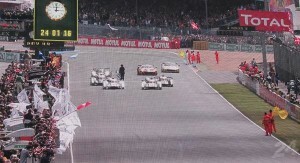 The rain managed to hold off for the 80th running of the iconic 24 hours of Le Mans. Audi has managed to win at the famed circuit 11 of the last 13 years. The race was more exciting than many had expected after the withdrawal of Peugeot, Audi’s main competition in recent years. Toyota returned to the Le Mans after a near 20 year absence, with a gasoline/hybrid and stepped in as Audi’s main rival to try and prevent a rout. This years contest was always destined to be trial of Hybrid technology. Peugeot had been developing a diesel/hybrid car prior to its withdrawal. The application of hybrid power trains seemed like the perfect fit for Toyota, who had recently departed the Formula One series after years of involvement. Audi brought four cars to the Circuit de la Sarthe, two of its super lightweight R18 Ultra diesel engined cars as well as a pair of R18 e-tron diesel hybrid race cars. 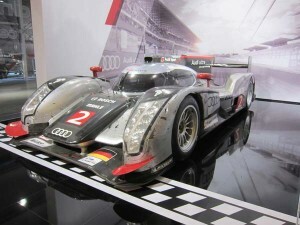 This was the first year that Audi has raced the experimental diesel/hybrid model. The R18 Ultra is a revised version of last years winning R18, with a mandated reduction in fuel capacity and a reduced air induction opening to limit range and power. The e-tron uses a flywheel accumulator system to power electric motors at each of the front. Activation of the hybrid system is controlled by an engine management system that automatically activates the Quattro system for maximum speed, efficiency and traction. Other than the e-tron system and its smaller fuel tank, the 2 R18 models are identical. The development of a split electric/mechanical Quattro power train has been touted for years as a weight saving solution for Audi’s passenger vehicles. Following the race Audi was quick to note that data gleaned from the cars telemetry system over the 378 laps of racing, was equivalent to years of testing in a conventional passenger car program. In a highly contrived but equally effective photo-op, all four Audi R18 cars crossed the line in lock step shortly after 3pm local time at the Circuit de la Sarthe. 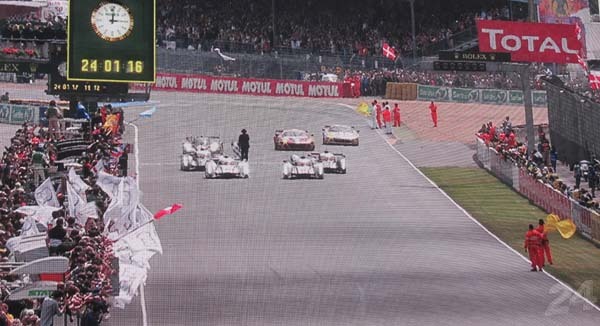 The parade of cars capped a dominating yet drama filled 24 hours of racing. The winning number 1 car was driven by last years winning team of Marcel Fässler, André Lotterer and Benoît Tréluyer. 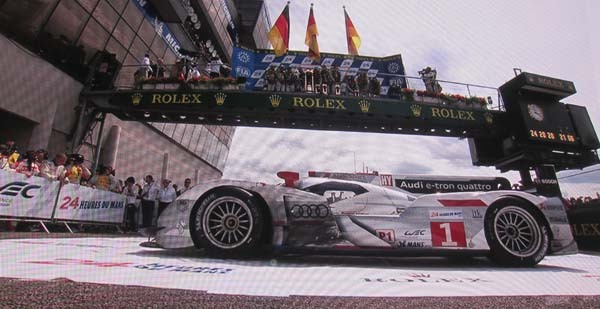 During the race, the e-tron models managed to sustain a more rapid pace and the fastest Audi e-tron model finished 3 laps ahead of the quickest Audi Ultra-lightweight car. The e-trons captured first and second place with an Ultra in third. The other Ultra finished 5th following a prolonged pit stop to repair front end crash damage sustained during an encounter with a tire barrier at the Porsches corner. In normal racing, a 30 minute pit stop is one that ends up being a terminal conclusion to your day or racing. At Le Mans however, when your race consists of 1440 minutes and attrition can be your best friend, you limp back to the pits and hope the vehicle is repairable.Toyota’s entries ran strongly in the early stages, even leading the race for a short while, before a spectacular crash occurred at the end of the Mulsanne straight. Toyota Team driver Anthony Davidson came upon Ferrari driver Piergiuseppe Perazzini, who failed to see the Toyota coming up alongside his right side. The resulting contact sent the Toyota airborne while traveling at over 300 kms/hr. Fortunately the tire wall combined with carbon fibre construction of today’s modern race cars prevented any fatal injury to the driver. Davidson will spend a couple days in the hospital with a pair of fractured vertebrae. Just one of the pitfalls of sharing the track with slower classes of vehicles. This episode was similar to two incidents in last years race that saw 2 Audi’s come together with slower Ferrari’s. To demonstrate the speed differential, after 24 hours of racing the first 2 categories had a 42 lap advantage over the fastest of the GT cars entered. Next year’s race at Le Mans should be even more exciting. After a sustained absence Porsche will be rejoining the fray with a factory LMP1 team. Toyota will be back and considering they had less than a year to construct cars and field a team, it was a decent initial showing. That being said, consider Audi has won 11 of the last 13 races here, their dominance is not to overlooked. The winning team this year crossed the finish line after 378 laps, a distance of roughly 5150 kms. The record distance for the event was established in 2010 when Audi won the race in a Turbo diesel R15, traveling over 5400 kms. By way of a historical perspective, at the first contest in 1923, the winning team managed 128 laps over the 24 hours, a distance of about 1740 kms.